SOUTH BEND, Ind. (AP) — Muffet McGraw doesn’t think Notre Dame is enduring a hangover from its 2018 NCAA championship. She thinks the top-ranked Irish have lots of problems to deal with. 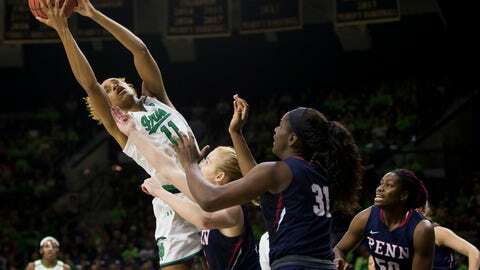 Arike Ogunbowale overcame poor shooting to finish with 21 points and lead four players in double figures as Notre Dame overcame 19 turnovers and pulled away from Penn in the second half on the way to a 75-55 victory on Monday night. Ogunbowale hit just 6 of 19 shots from the field, including 3 of 9 from 3-point land and finished with six assists as the Irish (2-0) struggled against Penn’s 2-3 one that limited them to 8 of 21 (38.1 percent) shooting and a 16-13 lead in the first quarter. “When I’m off on the shot, I’ve got to get to the basket, play defense and get steals to get myself going,” Ogunbowale said. Jessica Shepard scored 17 points, Brianna Turner had 16 points and 10 rebounds, and Jackie Young added 12 points after the Irish raised their 2018 NCAA championship banner in the Purcell Pavilion. Penn coach Mike McLaughlin doesn’t see many for Notre Dame, which is playing without senior point guard Marina Mabrey, who is nursing a quad injury that is day-to-day. “They are special and once they get everyone back, they will be tough to beat,” McLaughlin said. Ashley Russell scored 15 points and Kendall Grasela added 10 for the Quakers. It was Turner’s second double-double of the season after missing all of last season following ACL surgery. Mabrey is the team’s best 3-point shooter and its emotional leader. The Irish managed just three 3-pointers in the game, going 1 for 8 in the first half against Penn’s aggressive zone. The Irish were 3 for 12 from long distance. Notre Dame led 16-13 after the first quarter, missing five of its last seven shots. Turner had eight points and Shepard added six. Ogunbowale missed her first five from long distance and was irritated. But she finally made one as the shot clock was winding down late in the second quarter, starting a 7-0 run at 2:15 that gave the Irish their first 12-point lead of the half. Young hit a 10-footer to give Notre Dame a 39-27 lead at the break. Ogunbowale led all scorers with 13 points. The Irish started the third quarter with an 11-0 run before Grasela’s three-point play at 6:17 provided the Quakers their first points of the second half. The Irish run started with baskets by Young, Ogunbowale, Turner and Shepard. The last one came on Turner’s quick outlet pass to Ogunbowale, who fired quickly to Shepard, who was streaking to the basket. Notre Dame was in control 60-42 after three quarters. Penn: The Quakers, with a roster of 18 players, were picked in the preseason to finish second to Princeton in the Ivy League. It was Penn’s first game ever against a team ranked No. 1. Last season, Penn forced 22 turnovers and held Notre Dame to its second-lowest point total of their championship season in a 66-54 loss at the Palestra. The Quakers were anything but peaceful Monday night, forcing nine Irish turnovers and Notre Dame’s 44.1 shooting effort (15 of 34) in the first 20 minutes. “We had periods where the tempo was where we wanted it, but their transition — they rebound and go as good as anyone,” McLaughlin said. Notre Dame: The Irish had trouble against the Quakers’ aggressive 2-3 zone in the first quarter, hitting just 8 of 21 shots (38.1 percent) with Ogunbowale, visibly upset and going just 1 of 8, including 0 of 5 on 3-pointers. The Irish, who clearly missed Mabrey’s leadership, did get a lift from 5-foot-10 freshman Abby Prohaska, who played 19:38 and had two assists and one steal while also taking a charge. Notre Dame unveiled its 2018 NCAA Champions banner in a pregame ceremony. A brief video, which was loudly cheered when Ogunbowale hit her game-winning shots against Connecticut and Mississippi State at the Women’s Final Four last April, was shown before the banner was unveiled. It will join one saluting McGraw’s 2001 champions. “We got to experience it with our fans, the best fans in the country,” said the 6-foot-3 Turner, who got her degree last May after missing last season. McGraw, whose victory last April in the NCAA title game was the 800th of her career at Notre Dame, picked up her 890th overall victory against Penn. The 2017 Naismith Basketball Hall of Fame inductee is 890-271 in 37 years of coaching at Lehigh and Notre Dame, including 802-230 in her 32nd season at Notre Dame. McGraw, who has coached Lehigh and Notre Dame in 1,161 games, would be the fourth-quickest to 900 behind UConn’s Geno Auriemma (who needed 1,034 games to reach 900), the late Pat Summitt of Tennessee (1,072) and Stanford’s Tara VanDerveer (1,104). Penn: Quakers return home Thursday to play Saint Joseph’s, McGraw’s alma mater. Notre Dame: Irish visit No. 15 DePaul on Saturday afternoon.